I think this wallpaper look lovely and nice !! 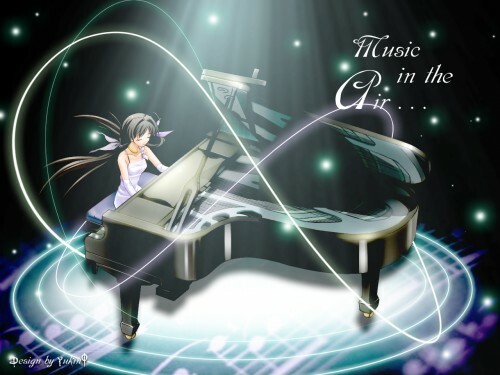 I love the whole scene, really show out the meaning, "Music in the Air".. Awesome work and thank for sharing !! i very like this wallpaper. it is very good. good job. thanks for share. this is really something. i like those circles below the piano and the lines surrounding it. great wallpaper. thnks for sharing. the extracton is a bit rough but the scene and everything else looks ok.
wow, nice pic! good Job.. thanks for sharing this I like so much this!! I want this be my favorite! there is absolutely nothing wrong with this wall, everything is put in its place with such care. I like the lighted floor and the music notes within it, and the background is nice and peaceful, and it dosen't take away from the image and the feel at all. I rarely even look at work from animes i haven't seen, but this will be the second time i have commented and favorited something i haven't seen, the wall is that good. The pixel is kind of rough, but it's ok. I like the bright effects, good job! Wow... this looks so nice.. Must download! *Favorites and download* Thank you for your time in putting effort into this wallpaper. I love it! ^^ Keep up the good work! Dang...That looks awesome. I like the effects centralizing the scan. It is a treat to see your work as other wallers that I respected seem to stop submitting their works. Thanks much for another fine piece of work. I really like... so cool.. the girl and the piano, and some awesome effects! ^^ Really a cool job! simple but awesome love it! The wall has a soft feel to it. And the swirlies move around her as if the notes she plays comes around and enwraps her. Very pretty work! !